Colored Pencil and Gamsol Coloring Tutorial ~ "Pansy Bunny"
True :D here with another coloring tutorial for you! This time I thought I'd show you how to use colored pencils with Gamsol (OMS or Oderless Mineral Spirits) to color the "Pansy Bunny" stamp that I illustrated for Clear Dollar Stamps. Grab a cuppa, sit back, relax, enjoy the movie! Hi friends! Its Katie here today, a little late, but finally here. Boy I hate it when life gets in the way (lol). Anyway, I wanted to feature a stamp set that didn't have the traditional release that we do for all of our other stamp sets. If you were lucky enough to play along with us during the grand re-opening of the Clear Dollar Stamps website you are familiar with the stamp set that was featured called Everyday Jar-gon. There were some of you that even won this set during our celebration, but don't worry, this set is still in the store just waiting to be snatched up and it is such a cute set that I thought it deserved some more time in the spotlight. I decided to create some smaller cards with this stamp set and then package them up in a cute mini magazine holder. I'm sure many of you have seen this card holder here and there and like you, I just loved it. The size cards that I'm making are called 4 bar and measure 3 1/2" x 4 7/8". They are smaller, but are still large enough to send through the mail. The envelopes can even be purchased at your local stationary store or online. We'll start with the holder first. Cardstock measuring 7" x 12"
Next turn your cardstock and score 1 1/2" just on one side. Next, cut on dashed lines. You will now want to measure in order to get the magazine holder look. You are looking at the 6 3/4" score mark and will be measuring to the right of this mark by 1 1/2". Do the exact same measurements on the left side of your holder. Now, its time to decorate. As I stated earlier, I love this set that Laurie designed - Everyday Jar-gon. Its very versatile and just plain cute. I decided to use the stemmed daisy image on the outside of my holder and then use it in the jar for my notecards. I also decided I wanted more than one stamped image so I got my post its out and created a mask for it. In the image below, you are looking at the flowers stamped and then the mask placed over it. If you are interested in a masking tutorial CLICK HERE. Here is one side all stamped and ready to be colored. I decided to keep my daisies mostly white and used my yellow marker to add color to the center parts of the petals. I also decided to tone down my yellow by using the Colorless Blender. If you look closely, you can see the difference it made - the flowers on the left side became more muted whereas the right side are still bright. All I did was use a very broad swiping and circular motion. If you use the Memento Tuxedo Black ink, it will not smear. I did this same masking and coloring technique on both sides of my card holder. I then had a EK Success border punch that I thought would look nice as a border. A lattice punch would have been fabulous, but this served the same purpose. I punched my edging first (length is 12") and then cut it to the right width - in this case 1 1/8". I then scored it at the same measurements as my card holder. Adhere to the bottom of the holder... dry fit your holder to figure out which side will become your front and then adhere your edging piece accordingly. I cut off the last section that would be covered in the front. Even though I wanted the white clean look, I decided to do a little bit sponging on the background with blue... super easy and just a light sponge was perfect using a dye ink. Now time for the adhesive. Again, dry fit and figure out where the adhesive will go. I then like to mark these areas and then lay flat and apply the adhesive. I could have opted to cut one of the smaller flaps, but decided it wasn't necessary. Fold up and put together. All done :) You can see where my marker bled, but it didn't concern me since there would be note cards inside. If this bothers you, you can always create a lining for inside your box or add another layer on the outside of your box. Now for the note cards. As I stated earlier, I decided to go with a smaller size card which is called a 4-Bar. The actual measurement of the folded card is 3 1/2" by 4 7/8" so if you are making them you will double those measurements. Before I get going on my design, I wanted to share with you a little about this set called Everyday Jar-gon. It is a set that builds on itself, meaning that you stamp individual stamps to create the specific image you are looking for. This is what creates the huge versatility of this stamp and many others you will find at Clear Dollar Stamps. In the picture below, I've stamped 3 different ways that you can create your jar. I'll share with you the step by step way I created my jar of flowers. I stamped the jar first. Next, I opted to have the open jar since I wanted to put my flowers in. Colored the daisies the same way as on the card holder. Used YG23 for the stems and B00 for the hint of water. Used the Colorless Blender in the same manner as with the daisies. Mat image on cardstock. Wanted to add some ribbon to the jar mouth along with my sentiment on a tag. I used a paper piercer to create my holes. Threaded some thin Offray satin ribbon through the holes. Threaded through my tag (stamped sentiment and cut with small oval punch) and tied into a knot and then adhered to my card base. Finished ensemble. The holder will hold the envelopes as well as the notecards. Wow, thanks for hanging with me with all those photos. They just kept growing and growing. I wish you a wonderful Tuesday and I will see you back here on Friday. Thanks as always... this is Katie signing off for Clearly iStamp. Misc. cardstock, EK Success border punch, offray ribbon, exacto knife, ruler, paper cutter, dye ink, sponge, oval punch, small scissors, post it notes, paper piercer. Hi friends, its Katie here to share with you part ONE of a TWO parter tutorial and idea concept for you. As many of you know and for those of you who don't, I have a family of boys. There are no girls in my immediate family, but luckily, I do have friends with little girls and the "boy" thing doesn't stop me from enjoying "girly" things. I wanted to share some items that you could make as either party favors or even as the party activity for your girls to have or do. With summer here, its a great time to have sleep overs or a great way to celebrate summer birthdays. Today, I'll be focusing on two stamp sets that I've used to create 2 separate items that could be put together for a party favor bag. The first stamp set is called Lip Gloss Fun and retails for only $4.99. I'll be focusing on one use of this stamp set, but it really is a multifunction stamp set. The second set that I'll be using is called My Little Books and is just a great fun accessory stamp set. So, I thought I would show you what I did with the My Little Books set first. Girls just love to keep diaries and I thought providing little notebooks for them would be fun. One of the examples that I made is with plain pages and I thought a book like that would be fun to add each others school photos or adding photos from magazines or whatever. The other book was created with both the composition book stamp and the notebook pages stamp. For both books I gathered them together and used a small hole punch to create the holes. Even with these tiny holes, it was super easy to add ribbon. The sheer ribbon is incredibly versatile works in these tiny areas. Lori just got 1/4" sheer ribbon in the store and those would be perfect for these little books. Twine would work just as well too. For the pages, I cut pieces of cardstock that measured 1 3/8" x 1 7/8" and then stamped with the pages stamp. If you have trouble putting your ribbon in, these embroidery needles work great too. After you get it threaded, just tie in a knot and your done! Sounds pretty simple huh? Well it is!!! I created my lip gloss labels first... super easy and lots of different ways to create them. A 1 1/4" circle punch is the perfect size for these labels and fit perfectly on top of the little jars that Lori has at the store. These jars are the cutest and work perfectly for this. 1. Dissolve packet of Kool-aid with 1/4 tsp hot water. It will get pasty, but don't worry. You can add sugar at this point if you wish. The gloss will be definitely more tart than sweet even with the sugar added. For some of the flavors I added about 3/4 tsp of sugar. 2. Add desired amount to the MELTED Vaseline. It is ok, if its not entirely melted. I put mine in the microwave for about 1 minute, but be careful with the type of bowl you use. It will get hot. 3. I used a small whisk to whisk it all together. Feel free to add more or less. 4. And make Kool-Aide with the left over... no waste here! The 3 flavors and colors that I ended up with were: Cherry, Orange, and Pink Lemonade. If you look closely, you can see some flecks in the cherry and pink lemonade. When the gloss is applied to the lips, these flecks dissolve as you rub. They will leave a light stain of color on the lips and will definitely stain fingers while making these glosses. These are just 2 items that I've shared with you. Next week, I'll have something else to add to the mix as well as a great way to present all this fun stuff. I clearly made these, but both these little projects would be super fun activities for your girls to do themselves. This particular recipe of lip gloss doesn't have to refrigerated, but some do. Go have fun and experiment. I found lots of different recipes, from these simple ones to much more elaborate ones (more adult and complicated ones). Would I actually use these for myself? Probably not, but I did send some of these to my neighbor girls who are 8 and 11 and they loved them and that's what counts. Thanks for spending some time at Clearly iStamp and make sure to come back next week for PART TWO. Yay its Tuesday and this particular Tuesday is a Stamp Spotlight. If you haven't guessed yet, its Katie here to share a little mini tutorial with you along with a great Stamp Set called Soil of Prayer. Talk about a set with a lot of punch! This set retails for $14.99 and like with a lot of stamp sets you will find at Clear Dollar Stamps it has an endless array of options. This particular stamp set is part of the Clearly Christian line, but as you can see it is a workhorse that will provide you with limitless options and some super pretty images too. Step 1: Along your 11" side score in from the left and right 1 1/4". If you have a Scor-Pal all you have to do is move the edge of your cardstock in to 1/4" which is the second mark and score at 1 1/2". Step 2: Turn your cardstock so that the 8 1/2" side is lined up against the left side of the Scor-Pal or your scoring tool. Score at 4 1/2" and 6 1/2". Step 3: Fold on the score marks and cut the folds that are labeled on the picture below. Step 4: Stamp before folding. You can stamp before scoring too, that is just a personal choice. At this time, you'll want to consider what you want to do to the front of your bag and do all the decorating at this point and then put your bag together. Step 5: Fold and glue together. Your options are limitless. I will often use ribbon for handles, but I do like sturdy ribbon for that or even wire edged ribbon. I like my handles to stand on their own if I can. You can also create just one handle that is attached from the narrow sides of your bag. In this case, I just used matching cardstock. And here are my cards that I made to go inside my gift bag. I like making the cards different, but I used the same colors and materials for the most part. I also included envelopes too. There is plenty of room for several more cards and envelopes if you wanted to make more. I had 5 cards and envelopes. I hope you enjoyed the Stamp Spotlight today. I had lots of fun using this stamp set and found it to be super versatile. Think about adding this one to your collection if you haven't already. Thanks for stopping by and I wish you a very happy Tuesday. Lots of stuff going on at Clear Dollar - Guest Designer Spot for May up for grabs and Sneak Peeks until the end of the month - Woo Hoo! I'm off to a crop benefitting Children's Miracle Network! I thought I would show you this week the little projects I have cooked up for the Scrap-a-thon I am attending this weekend benefitting the Children's Miracle Network. This is the third one I have attended, I believe, and they are always so much fun! We usually raise a lot of money for a great cause! What a cute little Easter ensemble to make up for some-bunny you love! This is the sample we will be making at the show....the others are food for thought! The card measures 2.25 x 4.25. All I did was take the normal size card front (5.5 x 4.25) and fold it in half! All the Flower Soft Techniques are explained in my Flower Soft Tutorial HERE. The biggest question is always: How did you color that? 1. Color the body and ears of the bunny with E31. Highlight under his chin and arms with E33. 2. Color the remaining part of his ear pink, RV000, nose pink, and color a cirlce of pink onto his cheek....the pink will push the brown out leaving a pink cheek! At first, there is a pretty harsh line, but as it sets the line softens out around the edge of the pink cheek. 3. Color your grass with B32 and highlight as shown with G07. 4. Color your background with B32....make sure as you color you keep all the edges of the ink wet...I color in little circles....this is what keeps you from getting the lines in your ink and creates the beautiful solid blue background! If you want to create the clouds in this, you need to do it BEFORE you color the rest. If you do it after you have colored, you run the risk of spotting up your other colors if the blending solution runs. Yes, this is the voice of experience. I poured a little of the Copic blending solution in a lid. I then dipped a cotton ball in to the copic blending solution. The blending solution will dry up in a couple of minutes, so once you pour and dip, you need to go ahead and work with it. Dab the cotton ball on your sky very lightly and watch your scattered clouds appear! You may want to use a cotton swab to get in the tiny spaces. Accessories and Embellishments: Flower Soft Glue, FS wires, Sweet Pea and Ivory Flower Soft, Waterfall Stickles glitter glue, I found this box at Dollar Tree in the wedding section. Special Techniques: To make the blue sky look like it has clouds floating in it, I poured some of my Copic Blending solution in to a plate. I took a cotton ball, dipped it in the Copic Blending solution and dabbed it on the blue sky creating scattered clouds....so easy and cute! This is a simple and quick card you can make up! The card is 3.5x3.5 inches. Special Techniques: Watercoloring Technique with Tombow markers. I will have a tutorial on watercoloring with Tombow markers the first Friday in April! You won't believe how easy it is! Good morning friends! Its Katie and that means it is Tuesday and time for a Stamp Spotlight. Today's Spotlight is really on a category of stamps with a focus on a couple of my favorite sets. So what I mean is that if you didn't realize it, Lori has a CLEARANCE section located at the store - Clear Dollar Stamps - that has some incredible bargains for you. These stamps are being retired and once they are gone, they are gone, but just because they are CLEARANCED doesn't mean that they aren't worthy of purchase or use. In fact, there are some really awesome sets there that are SO AFFORDABLE its a crime not to pick up a few while you are shopping. So, without further ado, let me share with you some cards that I made with just a couple of sets that I love to use myself. The first one is called Background Blocks and it could be in your little hot hands for only $4.99. If you haven't tried shadow stamping yet, this is a great set to do this with. You can also create your own coordinated background paper. Let me show you what I created with this really very versatile set. First off, the larger block is a very nice size and often times when I have a larger stamp and especially if its a solid stamp, I bring my ink pad to the stamp rather than stamp to ink. The coverage is just better. Now let me show you how you can get several different looks and colors by stamping and restamping your image. Notice how the images underneath are considerably lighter than the first image? Having that lighter image can provide you with a different and unique background to use while you are creating. You can also "huff" (just like you do on a cold day when you are trying to keep those hands warm) on your stamp before stamping for the second time. This can also be referred to as second generation stamping too. Now in this next image, what I've done is taken a darker ink and stamped a new image right on top of my long rectangle stamp. As you can see, its fun to experiement with different colors for a different look. For this example, I used the same ink color for all 3 ovals without ever reinking. I then added a sentiment which was reinked for each oval. This really gives you another option for stamping and designing those cards or layouts. So, do you want to see how I used these stamps? For this card, I used the small square stamp from the set above. I inked it up once, stamped, huffed, and then stamped one more time for a "pink" checkered look. After that, I used a stamp from the Ballerina Set also retiring, used Versamark ink, glittery embossing powder, and a heat gun for all my crowns. Lori just posted a wonderful heat embossing tutorial just the other day. Click -->HERE<-- for details. Just a quick insert here: I LOVE, LOVE, LOVE this Ballerina set. I didn't even realize it was being retired until I started writing this post and was getting my links. It truly is a MUST HAVE for anybody who either has a girl or knows a girl. Remember, no girls in my household! Here is a close up of the shadow background that I created with that small square stamp. I also used that square to ink up my crown tag, but for the tag, I stamped the same color ink onto the matching cardstock to get the brighter pink look. And one more card using this same stamp set. This time I used the oval stamp as well as the long rectangle stamp. The ovals of course are on the background and the rectangle one was used to create my shadow background for my bamboo stamp. That stamp is a relatively new release called Asian Plants. After I had everything stamped, I just tore my image out and then inked up the edges. I have one more stamp set to showcase for you. It is a sentiment set and in my opinion, you can never, ever, ever, have too many sentiments in your stash. They must come in all shapes, sizes,and fonts!!! This set is called Military Sentiments and can be considered a more "manly" style and for only $3.99 its a must have for you and still affordable to grab one for a friend.. I felt that it worked beautifully paired up with a background stamp called Heavy Metal (this one is not on clearance and can be purchased for $7.99 so you will be able to get it for a while!). There are actually quite a few sentiments in this collection and they are a great size. As I said, I paired the "happy birthday" sentiment with the Heavy Metal. Again, I was inspired by Lori's previous heat embossing post and this background stamp just screams to be embossed. I used Versamark again and then used Silver embossing powder. The affect of the heat on the powder is simply magical when watching. Here is a picture of the embossing powder just dry. And here is the finished card. I also added those super cute screw head brads that Lori also has at the store. Luvee them A LOT especially with all boys in the house! 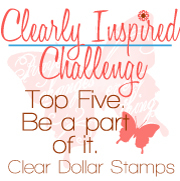 So once again, thank you for stopping by Clearly iStamp Blog and I hope you were inspired in some small way. Remember to go visit that Clearance Section!!! This is Katie signing off Clearly iStamp Blog. Happy Tuesday! Yes, we have a color challenge every weekend at Paper Craft Planet! If you want to participate, make sure to get over there and read the details! This is the first weekend I've had time to participate....how fun! Here is my entry! All other items are the same as the card in my previous post!